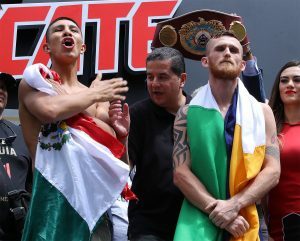 WBO super welterweight champion Jaime Munguia, (32-0) defended his title against Denis Hogan (28-1-1) in a scheduled 12 round affair in Monterray, Mexico on Saturday evening. First up, Patrick Teixiera (29-1) battled Mario Lozano (33-8) in a scheduled 12 round match. Texieria, in his energetic, circular style, appeared to cruise through the first three rounds. By the midpoint, Texieria was dominating, but not thrilling. It was shaping up to be a clean, one sided, and less than thrilling fight. In the second half of the bout, the crowd became restless, as things had slipped into a routine. In the eighth, however, the underdog Lozano started to coming on strong. Lozano came on strong again the ninth. Teixiera looked a bit gassed by the tenth and final round, but he had done enough by that point to win the fight by majority decision. Next up, the 21-0 Diego De La Hoya stepped into the ring to face the 24-12 Enrique Bernache in a scheduled 10 round featherweight match. The first round was close, though De La Hoya may have edged it. The second round was punctuated by two headbutts, the second one quite severe, which led to Bernache bleeding profusely from the center of his forehead. The fight was subsequently stopped by the ring doctor and a no contest decision rendered. It was time for the main event. Hogan’s awkwardness told the tale in the first. Hogan continued to look sharper than the champion in the second. The third saw Munguia starting to find his mark a bit. The fourth became action oriented, and – surprisingly – Hogan was able to go toe to toe with Munguia. By the sixth, Munguia was able to assert himself more, but it was a real fight. The seventh saw Munguia essentially in control, but it also saw Hogan land effectively. Hogan took the eighth, landing hard and clean. Hogan then arguably took the ninth. What’s more, Hogan actually seemed to hurt Hogan in the 10th. By the end of the twelfth it looked like there just might be an upset in the air. It was not to be. Munguia got the majority decision nod. A prohibitive underdog, Hogan proved to be a true challenge for the champion. He was slick, accurate, and at times even appeared powerful in his punching. Munguia, on the other hand, occasionally looked over his head and frustrated in the ring. Munguia also, however, showed heart, and the ability to not let an awkward foe run away with his title.